See our latest question and answer. Just need some professional advice? 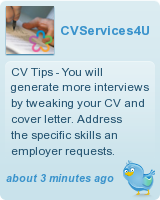 Sign up to our FREE CV writing course. Learn the simple CV fixes that instantly improve your success rate. These strategies work for everyone,from school leavers to senior executives. to evidence that you can provide value. Our team of qualified experts will help you with regards to CV writing, cover letter creation, interview preparation and job applications. Our customers often compliment us and commend our willingness to provide free advice that helps to ensure you achieve your career aspirations. If you need help in any area of your job-hunting ventures, please do not hesitate to contact our customer support team - 0333 123 1131.